The NBA never truly sleeps. Jimmy Butler’s trade request last week reminded us of that. The request itself did not come as a surprise. Reports out of Minnesota this offseason have made it clear Butler is unhappy with the his current situation. He has grown frustrated with Karl Anthony-Towns and Andrew Wiggins as well as his current financial state. What is surprising, however, is Butler’s preference in teams: the Clippers, Knicks and Nets with Los Angeles taking the top spot on his list. 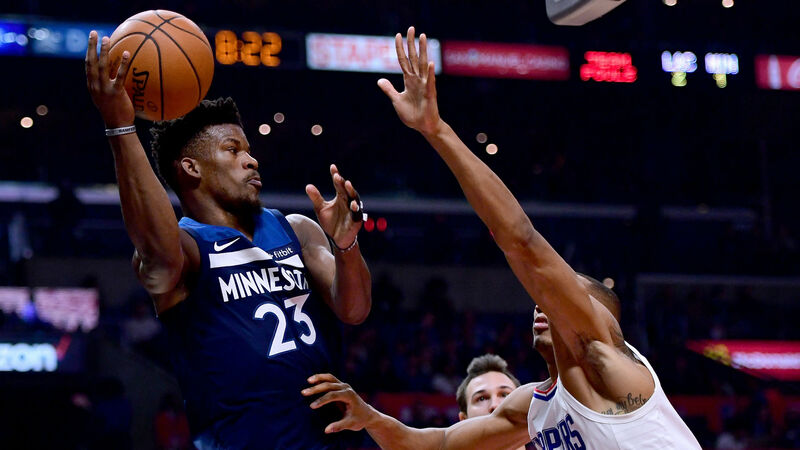 Minnesota’s Jimmy Butler is most determined to find a way to the Los Angeles Clippers, league sources tell ESPN. The appeal of partnering with a second star — the Clippers have two max contract slots available in summer free agency — is an intriguing scenario for him. TRADE RUMORS: Could Raptors make move for Butler? What the Clippers must now decide is how to go about acquiring Butler. With one year remaining on his current deal before he can opt out and become a free agent next summer, a trade for Butler is a risk for any team looking to acquire his services. He will have the option of hitting free agency if a new deal cannot be reached. That puts a team like the Clippers in an interesting position. With the understanding that Butler actually wants to join the Clippers, what kind of assets should the team realistically be willing to give up? The Clippers do have a number of expiring contracts that could be desirable for the Timberwolves. Tobias Harris and Patrick Beverley are productive players on expiring deals, and their experience should appeal to head coach Tom Thibodeau. But if the Wolves do decide to move Butler, they will want more than just expiring contracts. Would the Clippers include 2018 first-round pick Shai Gilgeous-Alexander or Jerome Robinson? Would Lou Williams be on the table? It seems unlikely that Jerry West and the rest of the front office will throw the kitchen sink at Minnesota — not when Butler has made it clear that LA is his preference. But playing the waiting game also comes with risks. The Lakers were in a similar situation two years ago. Paul George told the Pacers that he intended to sign elsewhere when his contract expired. All signs pointed toward the Lakers — it became an assumption whenever George’s name entered the rumor mill. Despite George being traded to the Thunder, the general consensus was that he would play one year in Oklahoma City before returning to his hometown to play for his favorite franchise. But a lot can change over the course of a season. The Thunder took advantage of a full year of recruiting, convincing George he should spend his prime years next to Russell Westbrook. George’s decision to re-sign with OKC was a shocking development for the Lakers, especially considering the team didn’t even get a meeting with George. The Clippers will be taking that same risk should they wait until the summer to pursue Butler, and not having the four-time All-Star already in town could change LA’s chances of adding Kawhi Leonard later. Ultimately, Butler’s future lies in the hands of Timberwolves owner Glen Taylor. Even if Thibodeau isn’t on board, Taylor is committed to moving forward with Towns as the No. 1 option after the 22-year-old recently signed a five-year, $190 million extension. Of course, the Timberwolves will be looking to get the best return possible. They are under no obligation to honor Butler’s request. That list ultimately means very little in this process. That leaves the Clippers with a major decision to make. Do they give up assets in order to guarantee that they lock up Butler for the next several years? Or do they play the waiting game and let everything unfold, betting that Butler chooses to join the Clippers in the summer? The NBA never truly sleeps, but the Clippers might find it a little tougher than most teams to get any rest with these big questions in mind.